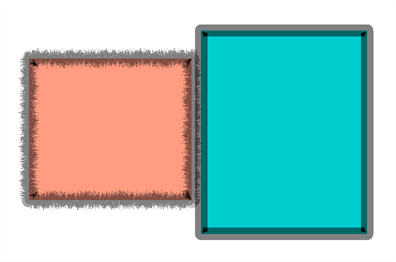 A central vector outline can obscure the true edges of a shape's fill. You can change the opacity of central vector lines and outlines, while working, to bypass this problem. This feature only works in the OpenGL view. This feature is meant to be used as a working tool, like the Light Table or Onion Skin, therefore this transparency effect will not appear when the scene is rendered. 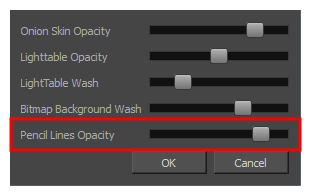 However, the opacity value that you set will remain as the set preference, even after you end a session and close the software. If you want the transparency of a line or outline to show up in the render of your scene, use one of the many other options that Harmony offers, such as colouring the line with a semi-transparent swatch or using the Transparency or Colour-Override effects. In either the Drawing view or Camera view toolbar, click on the Top Light icon. The Pencil Lines Opacity feature can also be accessed through the Preferences panel—see Drawing Preferences. The Onion Skin and Light Table Transparency dialog opens. In the Onion Skin and Light Table Transparency dialog box, use the Pencil Lines Opacity slider to globally increase or decrease the opacity of central vector lines. Sliding the slider all the way to the right equals 100% opacity. Sliding the slider all the way to the left equals 0% opacity. NOTE If your object has a vector contour outline (created by the Brush tool), this feature will not work. It must have a central vector outline (created by one of the shape tools or Pencil tool).